Safety, discipline, and expert instruction are the foundation of our Kid’s Muay Thai, Boxing, and Jiu-Jitsu classes, held daily at 4:30 and 5:30 PM, as well as on Saturdays at 10:00, 11:00, and 12:00 noon. Each of our 23 kid's classes each week are tailored to meet the needs of specific age groups, so your child is always learning and having fun with kids their own age. In addition, parents can watch while our expert Coaches instill confidence in all aspects of their child’s life, while they gain practical skills of self defense in these fun and energetic classes. And Parents can take adult classes or work out at the same time. And there are no Long Term Contracts to sign at Victory. You “Pay As You Go,” and cancel their membership if you need to, with no cancellation fee. We guarantee the most fun classes, the most professional classes, and the safest environment in all San Diego (We have 30 security cameras), or your MONEY BACK! 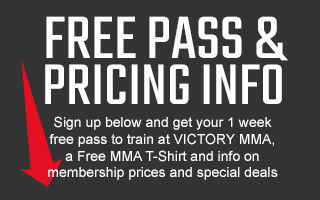 SIGN UP FOR A FREE WEEK OF BOXING, MUAY THAI, AND JIU-JITSU CLASSES FOR YOU AND YOUR KID! Join for as little as $99.00 a month and enjoy unlimited access to twenty three (23) Kid’s Muay Thai, Boxing and Jiu-Jitsu classes each week, with discounts for mulitiple children, families, as well as military and other qualifying groups. As a student in our Kid’s Muay Thai, Boxing or Jiu-Jitsu classes your child will learn how to overcome the challenges and obstacles they encounter in life. They will develop increased self-control and focus, which will help them in everything they do. Their behavior will improve, as will their school work. They will be more outgoing and make friends easier. They will be empowered with confidence, and learn how to make healthy lifestyle choices, to keep them mentally and physically fit for the rest of their life. Our Muay Thai, Boxing, and Jiu-Jitsu classes are designed to keep kids fit, happy, and healthy! And the program offers a variety of activities in addition to the instructional classes, such as tounament participation and team building outtings, that promote growth, achievement, and discipline. While the core of their training is in the development of real and practical self defence skills, we will also encourage your child to set goals and meet them, and to be responsible for their own actions. Your child will learn how to better interact with people, and how to use proper conflict resolution.